Egyptian squash players World No.13 Mohamed Abouelghar and World Champion Raneem El Welily both snatched the China Squash Open men and women titles on Sunday at the Peninsula Shanghai. Raneem El Welily managed to win her second China Squash Open after defeating France’s Camille Serme 3-1: 11-5, 8-11, 11-6, 11-5 in 41 minutes. “I’m very happy that I’m through, it’s always good to play against Camille, she’s very fair on court and I really enjoy playing with her,” she told PSA World Tour. “I’ve won this tournament here before and done so badly afterwards in a previous season, so I’m just happy with the win for now, I’m not thinking about anything else. The plan this season is to take it one match at a time, one point at a time and one rally at a time. “Hopefully I can play this well again this season, I’ve got to play harder to improve and work on new stuff,” the player concluded. 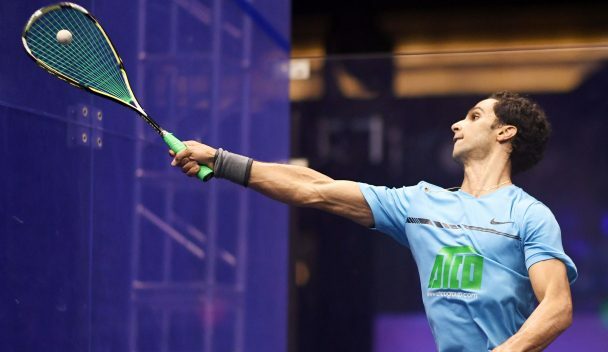 As for the men’s competition, Abouelghar won the biggest PSA Tour title of his career so far following a deserved 3-0: 11-8, 11-8, 11-8 game in 44 minutes beating World No.10 Paul Coll. The Egyptian surprised everyone when he managed to defeat former World No.1 Gregory Gaultier in the tournament’s quarter-final match. “I expected before the match that it was going to be hard work, and if I wanted to have any chance against Paul I had to be patient and not go for shots as often as I would like. “I think when I was sharp when I went short and I’m happy that it paid off.